Took a long walk this morning from 1st Ave to 14th. Walking is a form of technology, really; in that it's a sort of interface for processing one's surroundings. First: The size of the boulevards. Being an East Coaster, I find six-lane one-way streets in the middle of a city somewhat confounding. But everything is sort of bigger and broader out here; influence of the Rockies, for sure. Second: Architecture. Architecture and the lack of it. There's a lot of construction going on and even the older parts of downtown look freshly dusted. The library and the art museum are particularly impressive -- both models of innovative design. It's an odd contrast to the quite large population of homeless and mentally ill you'll find all over the city. Certain parts of town are downright wastelands and if anyone here at the convention could point me in the direction of anybody working with these populations in Denver, I'd love to talk and hear about what's going on. Third: Fruit trees. I love seeing fruit trees along the sidewalks. Walking into downtown this morning, I passed through a neighborhood where a bunch of sturdy apple trees grew along the side of the road. And it seemed like a pretty good metaphor for the way I'm experiencing Denver -- for in a city full of big roads and bright buildings, it's in those old roots finding their way under sidewalks and along curbs that I see what a city can be. Things are winding down a bit as people are strategizing how best to acquire free food. Grub makes the world go 'round and that's especially true at ISTE. Well, the guy next to me just asked someone if he worked for Microsoft... based on the blue shirt he's wearing. And earlier in the day someone mentioned being upset to find that not all the Open Source guys had beards. So -- and I realize I'm tired and delusional -- but, the question has to be asked: "DO WE LOOK LIKE THE TECH WE USE?" What's a Wikispacer look like? What does a Waver wear? Is there a Jing dress code? You tell me. I'm headed for grub. Biggest "non-ballroom" crowd I've seen so far: @crafty184, @jonbecker, and @brueckj23 leading a not-dumbed-down introduction to Twitter for education and leadership. a) I think there's something to be said for the fact that this was the most packed session I've seen so far. b) Kudos to the trio for helping a lot of folks how to access that "other" conference going on via the Web simultaneously as the physical one here at the Denver Convention Center. Access to that meta-conference is priceless; it's where connections are being made that will long outlast anything said in these rooms -- connection both with people here in Denver and with folks around the world who are pushing education and leadership in new directions. Very interesting session on semantic technology and Web 3.0. Check out Calais for some mind-blowing changes in networking and 'knowledge content'. Best point of the session (paraphrased): "Let's keep up with what's going as it's going on." Just had a great conversation with Denise Atkinson-Shorey about national broadband. She's from the EagleNet project and they are working on a stimulus grant proposal to bring broadband wi-fi to every school kid in the state of Colorado. EagleNet is a non-profit consortium and wants to work to bring in the infrastructure to help schools, libraries, and public buildings become hubs for wi-fi. As Scott McLeod piped in: "Broadband wi-fi should be pushed out like water or electricity." And that's absolutely true -- and it seems like it's doable. We dig trenches to build roads and interstates, we've go miles and miles of electricity and telecom already crisscrossing the states. So, how do we (or do we?) latch onto existing infrastructures and make use of public buildings and already-present community resources. Would love to hear from some of you broadband/wi-fi gurus out there, I'm a bit out of my element on the technical side. The mission of EAGLE-Net is to enable access for technology-rich, quality education to every student in all 178 Colorado public school districts via broadband network services, advanced applications, and Internet2 and National LambdaRail connectivity, including those in rural and underserved areas. This mission is being expanded to include collaborative partnerships with Higher Education, Public Libraries, Museums, Fire/Safety, Healthcare, and other non-profit entities. Collaborate to link and link to collaborate. It's a great idea... does it have legs? Well, not really, but you know what I mean. Hoping to meet with a few bloggers and chart a course of action, a plan of attack, a... well... I want to figure out what to see and when to see it. If you are at ISTE 2010, please leave comments here as to what I should see over the next three days. Last year, I pulled off 25 posts in 4 days... and I think at least a few of them made sense. This year, I'm looking for you to tell me what interests YOU. I'll try my best to cover all I can. Scott McLeod put together a list of everything happening here over the next few days; check it out whether you are in Denver or whether you are elsewhere in this big world. For the next three days, I'll be blogging and tweeting from ISTE 2010 bringing you full coverage from the convention floor to the blogger's cafe to the session and workshops. Stay tuned. Our 400 student school spent almost $10,000 this year on paper and toner. As a frugal office manager, this makes me crazy! Those funds could do so much more than make copies. Sure thing. Coupled with textbook costs, source redundancy, and ill-thought-out tech plans, it all adds up to the fact that the digital divide is really a matter of poor resource allocation. Interesting discussion brewing over ISTE's call for those participating in the backchannel at this year's conference to "be nice". Personally, I'll take "be civil and critical" over something as squishy as "be nice" anyday. Backchannels are not just places to give kudos and shoutouts; and while I certainly like "nice" people, the concept of "nice" as a self-regulating filter through which to engage the backchannel can just as well turn that backchannel into something "pandering" -- and even worse -- "uncritical". Backchannels are a place to share; they are also a place for discussion and debate to develop, and -- particularly in the enormous keynote sessions -- the backchannel is a democratic forum for keeping speakers honest. The backchannel is the place where you can go during a speech to hear the voices and reactions of the people; and we should celebrate that even when the voices get heated or snarky. Looking forward to the ISTE backchannel myself; and I hope to learn from and to engage with as many voices as there are filling those channels with real human opinions of all stripes. Now it could be that the commenter is right and I just have very little understanding of human nature. But I'll at least try to address each of his or her points. 1. Desks -- especially desks in long straight rows -- are not only detrimentally conditioning and hierarchical, but they breed an "us vs. them" mentality between students and teachers. As far as cheating goes, I wouldn't blame that on seating arrangements; I'd suggest it has more to do with assessments that are so removed from individual and personalized learning that they are ripe for standardized cheating. 2. Language Labs -- I'm not talking about getting rid of foreign language study, I'm talking about getting rid of outdated language labs. Any kid with an iPod Touch and wi-fi can learn a foreign language. 3. Computers -- I actually don't understand the comment here. But the gist of the original post was that computing devices are going to change in ways we can't expect -- therefore we can't expect what we think of when we think of a computer today to be necessarily the same thing as what a computer will be tomorrow. 4. I really don't know exactly what homework is for. I've been frustrated with myself over this issue, as I tend to think that I give too much homework (generally in the form of writing, which of course in and of itself isn't a bad thing; but I often have difficulty striking a balance). The key is in having kids do things outside of class that will complement or drive things within class; problem is that too often homework not only fails to do this, but in fact instills bad habits and resentment towards school in general. As the school-day itself is gradually redefined over the course of the next decade, I do think however that our concept of what exactly homework is will change. 5. Yes. Smart kids perform poorly on standardized tests all the time. 6. Tech and Differentiation: Agreed. But social tech that allows for individualized instruction -- like using Google Wave to track individual contributions to group work -- are of such an amazing benefit. Takes a lot of the guess work out of trying to figure out who understands what at any given time. I do stand by what I suggested in the initial post, as well: the teacher who in ten year's time can't figure out how to differentiate instruction will be the teacher looking for a new career. 7. Wikipedia is an encyclopedia. Would you rather we not let students read an encyclopedia? As far as "research" goes, no encyclopedia has ever been primary source material for a thesis. That is unless your thesis is about the encyclopedia. You teach kids to back up an academic argument with primary sources and direct observation; but that doesn't mean you don't "let" students read an encyclopedia. As for Harvard students: they read Wikipedia all the time; many of them edit it, as well (just like millions of other people). 8. As for paperbacks, I don't think this will be as "school-driven" as it is "culture-driven". With the advent of really nice e-bookreaders, I could see the majority of the paperback market going the way of cassettes and CDs. As for the allocation of resources, we already spend much more on textbooks over the course of a student's schooling than we would on wi-fi based e-readers. 9. We've been using optional fingerprint scans in our school for laptop access since back when Vista came out. Not that scary. 12. The conversion to hybrid school models mixing face-to-face learning with online and mobile learning is already happening. I see no reason to think that might slow down over the next ten years and I see no reason given the budget shortfalls so many districts and archdioceses have found themselves in that the larger centralized bureaucratic model would remain desired. Thanks for your comments. I hope you understand that I take them very seriously and I welcome the opportunity to debate. And believe me, as a teacher and a parent of three kids, I know exactly what it means to "get real"; it's what I try to do in the classroom, in parenthood, and on this blog everyday. Working with an elementary school student with working active memory issues + dyslexia. Several folks answered my call for more information about helping kids in this situation; one of the best links I was directed to was All Kinds of Minds. I am looking for more information, and you -- the readers of this blog -- are without a doubt the best resource I have. So I'm asking for help, advice, thoughts, experiences related to helping students with working memory issues to learn and gain confidence in academics. What are things that have worked for you? What hasn't? And it what ways can we turn a difficulty into a benefit when it comes to learning and loving to learn? American Educator publishes new piece by Dan Willingham (in pdf. form), piece promptly gets criticized on Net (on a blog). There's something in that, methinks. I've got no problem with a cognitive scientist talking about the brain all he wants. I think there's a lot to learn about learning in the work of Willingham and other academics. I actually like Willingham and have chatted with him occasionally about issues in education. And I think we should be thankful to have someone in the cognitive sciences with an interest in what we do as educators. But, I think that just as we need the help of cognitive scientists to help us better understand the brain, they also need us to help them understand the context and reality of the classroom. And this has to be a conversation, not a series of diatribes. Otherwise, we create something analogous to a music journalist telling a musician how to play better and the musician turning around and saying the journalist doesn't know how to write. And that's useless. One of the first things Willingham says is that "new technologies do not represent a silver bullet", and on that front he's absolutely correct. And I don't think any proponent of ed tech would argue with him. And I don't think any teacher with any amount of experience whatsoever in dealing with kids would think that there's a silver bullet for anything. Where Dan starts to lose me, however, is in completing that thought by saying that "Just using a new gadget does not guarantee student learning". It's not that I disagree with that statement in and of itself, but rather I disagree with what the statement assumes: that technology is about gadgets. We have to be really careful to explain what we mean by "tech" and what we mean by "gadget". An iPad is a gadget, but it allows for the operation of technology. A laptop is a piece of hardware, it's a gadget; but it allows access to the greater operation signified as the technology of the Web. I'd say there are passive devices and active devices. Passive devices give you content; they simulate in digital form what we've come to expect of the physical world. I'd put a Kindle in this category; the screen on a Kindle attempts to simulate the page of a paper book. Active devices, on the other hand, are open and promote sharing -- by design. Active devices allow you to get onto the Web and do stuff, make stuff, create stuff, share stuff, and -- most importantly -- learn by doing. Active devices have the capacity to allow the user to manipulate the content of the Web from the point of view of creator and editor, author and reviewer -- all while breaking down the traditional hierarchies and top-down corporate models of content production. So in the same way that there is a difference between a gadget and technology itself, there are also differences among types of gadgets. I'm not sure from this article, however, exactly what it is that Willingham is defining as a "gadget" and what he defines as "tech". He seems to equate Web 2.0 tools and computer hardware in some odd way. For example, in a list of possible downsides to several devices, he suggests that Twitter isn't very useful because it is "limited" to 140 characters (granted in an entire article on tech and learning, that's all the attention he gives to Twitter). But, as anyone who has spent any time with Twitter soon realizes, the technology is not "limited" to 140 characters. Nor is Twitter really a "device". Allow me to conceptualize here. Twitter is a searchable network format for sharing and searching info and links in real-time. I think Willingham may be thinking about Twitter as a "gadget", whereas it really represents a "form" of communication, not a "device" for communicating. In a way, "tweeting" as a communication technology has transcended the device of "Twitter" -- and it did that long ago (in relation to how long it has existed). That distinction -- between tech and device -- is understood only once one becomes fluid in the application of the technology to a variety of working problems: from direct communication to sharing links to following conversations via 3rd party apps to using Twitter specifically for pedagogical purposes like hashtagging classes or searching in real time to gauge mass response on a current issue. Tweeting, therefore, does not represent the act of using a new gadget, but rather represents a mode of communication unique to the current cultural paradigm. By analogy, the telephone was a gadget; but the act of telephoning was a form of communication technology in action. Willingham writes a very compelling section of this paper on interactive whiteboards; and he says that the mere presence of an interactive whiteboard does not mean that students will learn better. And he is 100% correct. But he and the other researchers could have asked any experienced teacher and they would have given you the same answer. Because the whiteboard is a tool/device/gadget. And no gadget will produce any significant result on its own accord. Rather, the whiteboard has to be used in an effective way by the teachers and students. If the whiteboard is used in a passive way, you'll get passive learning (if any). If the whiteboard is used in an active way, you are more likely to get active learning. Willingham makes a strange case concerning overhead projectors in comparing them to chalkboards -- or more specifically, what is written on a chalkboard. Citing a study of Japanese math teachers who prefer chalkboards, he says that the reason why is because the notes written stay up on the board and can be referred to later. But the comparison of overhead projectors to chalkboards denies the reality of what a projector actually does. A projector projects. That's it. A chalkboard, on the other hand, captures handwriting. The more apt comparison would be between a chalkboard and whatever program or app one is using. So, if a teacher is concerned about 'saving info' on the board, just use a program or app where the info is saved, open multiple tabs, use a backchannel, and by all means in any 1:1 situation: let your students access the information and notes you are creating in real-time; the blackboard, by contrast -- I can't believe I'm actually blogging this -- can be erased. And that info is lost forever. And it is so much more difficult to share. 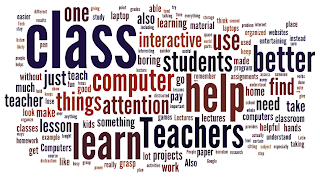 In a way it seems to me that any teacher who would prefer the blackboard -- for the reasons stated -- just hasn't taken the time to figure out how to use the technology. For the record, it's actually easier than programming the time on a VCR. Now, those are examples where I think Willingham's arguments don't really jive with the reality of an experienced tech-savvy teacher/learner. There's a lot in Willingham's work that really does work. His criticisms of multi-tasking ring true for the most part, and his observations that brain research can and should apply to teaching are not things I'd argue with. But I think Dan needs a bit of an immersion lesson in ed tech. And so, I suggest we thank Dan for the good stuff he's been doing and offer to help him understand where many of us are coming from. After all, Dan writes about Twitter (sparsely), but -- and I say this as a person who has spent his fair share of time sharing and learning through tweets -- I don't think Dan really gets it; because I never see him there. I never see Dan in #edchat. I never see Dan getting into Twitter conversations (and that's actually one of the great things about the format: you can watch other people's conversations develop in public). I never see Dan sharing links. And when I look at the bibliography of his article, I see lots of peer review journals cited, but I don't see any sign that Dan has done any of the dirty work -- I use that term endearingly -- of ripping into the real live 24/7 conversation that's happening in the Ed Tech community every single day. So how could he possibly understand? He's busy referencing articles by a lot of other folks who aren't there. And don't get me wrong, I'm a big fan of academia and I think there is an enormous contribution to be made to intellectual life by the writing and reading of peer review journals. But Willingham's article makes recommendations to teachers about technology -- and Willingham himself isn't even adept at the technologies that he's writing about. Some of my favorite twitterers are academics -- from Alec Couros to Jay Rosen to Ira Socol -- who've come to use the format as a perfect place to share ideas and engage in debate with the public. So let's help Dan. Let's get him into our PLN. Let's help him understand what this is about -- not by reading a book about it, but by actually doing it. And I'm serious about this. I may have disagreements with Willingham on many issues (his thoughts on learning styles come to mind), but I respect that he's taking part in a dialog about teaching. I just wish he'd take part in that discussion in a more open and perhaps less sheltered way. Yesterday, I posted about a Freshman who had published over 100 blog posts in a single semester of my West Civ class. A few readers asked if he was one of those outliers who stand apart from the crowd. That's a tough one to answer. Because in one sense, yes of course any kid who writes that much over the course of a semester is an 'outlier' of sorts. But so are the kids who only produce a dozen posts. In my classes, over 80% of the students posted more than what was required. What does that mean? "Why" are some kids compelled to write so much and put so much time into their blogs? I come back to the idea that a student writes 100+ posts in a semester because the student owns the learning. I've posted here screenclips of blog archives of four students in my Latin III class. These are high school juniors in a year-long class. Collectively, they produced five-hundred-and-fourteen posts in a single semester. They comprise everything from notes on vocab to student translations of Latin primary sources to pieces that consider current events from the eyes of ancient historians. And by-and-large, few of these posts were instigated by me. Rather, the students decided what, when, and how to blog. Each student used her or his blog in a slightly different way. Some use them as their primary 'notebooks' while others use them more for personal reflection on issues both within and without the classroom. The students post tests, translations, and bibliographies directly to their blogs: this way, they have easy searchable access to all of that material available on the Cloud via any computer or device. As a blogger myself, I certainly subscribe to the notion that our blogs are extensions of our personalities and windows into our thought processes. On a personal level, blogs are searchable web-based archives of our own formation and development as thinkers and learners. In recognizing that, we come face to face with a new reality about the way that we should be assessing our students -- as well as ourselves. Got a screen-clipping I'd like to share with you. This is from the blog of one of my Freshmen in West Civ class. You can see the titles of his recent posts: "Exam Practice", "Battle of Tours Wiki Source", "Notes West Civ 5/20/10", "Is Monarchy More or Less Effective Than Democracy? ", etc. You'll also notice the number of posts this student published in 2010. He published 113 blog posts. One-hundred and thirteen blog posts. During a semester long course. The required number of blog posts for the course? What's going on here is a case where we've got a student who OWNS his blog. We've got a student who has turned his blog into a veritable compendium of West Civ that he is going to be able to use as a searchable reference throughout his high school career. He is going to eat AP Modern Euro for lunch. He is going to pwn British Literature in his senior year. Because he owns his knowledge. He owns his understanding. And he's made something authentic: his own personal resource... and a record of the history of his own ideas. That's why I want students to blog. Got together recently with folks at our local public radio station to talk about education. Thanks to the folks at 88.1 WYPR for inviting me over to chat -- especially everyone at Maryland Morning. Today's question of the day has to do with vision-thinking this thing we do called education. There has been a lot of talk over past few years about the changes necessary to make education relevant in the 21st century. Seems like the basic dichotomy comes down to: do we fix/rebuild/re-work the present system or do we have a revolution and start something new? Well, the former position has had its fair share of commentary over the years; so just for the sake of today's question, I'd like to concentrate on the latter. Say we did have a total revolution in education; say we could start anew. What would be your vision for education and schools if given the chance to start fresh right now? (Think big). I'm posting these "questions of the day" all through our school's exam week as a way to spark discussion about topics that have been popping up on Twitter. Today's question is therefore especially timely. In assessing a student's understanding, how effective do you find traditional "Scantron + Short-Answer / Essay" final exams? Do you feel like you gain a better sense of the student's understanding of the material as you grade this type of test? Have you ever been so surprised at a student's success on one of these exams that it made you re-evaluate your overall assessment of the kid? Or do these types of exams generally tell you nothing more about the student than what you already know? Today's question is pretty straightforward: Should school administrators serve term limits and return to classroom teaching once their term is up? Thanks to @dpeter, @AndrewBWatt, @tmsaue1, and @daveandcori for inspiring this conversation on Twitter this morning. With summer approaching, lots of teachers are again debating the merits of summer projects. In my experience, summer projects -- usually reading assignments with some sort of summative component graded by the teacher during the first week back -- are relatively unrevealing of a student's learning. They tend to be more of the 'proof you read the book' variety. It seems that if you were really going to do an authentic summer project, you'd want to do something with a formative component. After all, it's not like we just give a kid a book during the school year and then test them on what they read three weeks later without ever talking about the story in the interim. So why give a student an assignment over the summer if the teacher isn't going to be there to assess understanding in an on-going way throughout the student's learning? Unless of course, typical summer projects aren't really about learning. Obviously, a virtual environment would offer students and teachers to meet throughout the summer. There students could ask the questions they are bound to have and engage in real-time in online discussions with their peers in learning. Of course, that would mean something of a summer commitment by the teacher, as well. So, today's question: In a 24/7 connected world, should we require students to complete summer projects? And, if we do, should we require teachers to assess the projects on an ongoing formative basis throughout the summer? I look forward to seeing where this conversation leads. how is it that teachers continue to pull out the same lesson plans when they have not met their students yet? Just a thought. It's true. As teachers, we're trained to prepare. We've got arsenals of prepared lessons, assessments, schedules. But there's one thing we can't prepare for: we can't prepare for which students are going to walk in our door. Sure, we might know some of their names in advance. We may have heard stories of their prowess on the softball diamond or their antics in Ms. Jones' chemistry class. But we can't really know who those kids are until they've come through that door, sat down in our classroom, and opened their mouths and told us who they are and what matters to them. This is why the ability to 'differentiate' shouldn't be the mark of a good teacher, but rather the expectation of anyone who calls his or herself a teacher: because if you don't understand your kids, how can you expect them to understand you? I'm making it a goal next year to not plan out my courses until I've first met my students. My plan going in is to meet the first two days of class with the students to learn the interests of each and to help them start PLNs on Twitter to extend their interests into a broader real-time conversation. Then I'd like each of them to explain the ups-and-downs of their prior experiences learning -- both in the classroom and out in that zone of experience the education folks call "informal learning". We're gonna spend some serious time getting to know how each other like to learn from the very beginning before we ever even touch on course material. They won't be getting a syllabus, either. Rather, we'll take a look at the general themes of the course -- next year I'll be teaching West Civ and Modern Euro History -- and we'll start constructing a wiki to structure where we want to go. I'll guide them by adding some historical context and then help them use Twitter to start crowdsourcing the essential questions we'll use to guide our study. I'm also teaching a Human Geography course and my co-teacher and I have been swapping ideas back and forth. The one we are gravitating towards is not having a curriculum at all, but rather having students listen daily to PRI's The World each night and write daily blogposts about what they hear. Classtime will be spent discussing the previous night's episode and helping students to fill in details and to learn how to access more information about subjects talked about on the program. We as teachers will constantly be learning new stuff at the same time as our students. Rather than thinking of this as being perpetually 'unprepared', it'll actually be more a situation where everyone involved will bring to the table whatever they've got with them. Classtime will be a matter of sorting things out and making connections; and of course, we'll have our PLNs to turn to for help, ideas, and advice. And by the end of the semester, each student will have a complete digital portfolio of their own responses and comments to their responses to daily world events. I think both approaches emphasize dealing with the real-time world in real-time. And that's where I think my students and I need to be. My students and I had a conversation today about learning. They'd like to share their thoughts with you. [I've put some of the most interesting comments in bold]. "Teachers would help me learn better if they applied what we were learning to events outside of school. Also, if they stuck with us in the lessons step by step to make sure we understood them, that would help me learn better. It would be useful if teachers in lectures would also relate subjects in lectures to things students do at home or for hobbies." "Teachers would help me learn better if they judged better the time it takes to complete assignments; with in a reasonable amount of time. They would help me learn better if they gave more class work grades then homework grades. They would help me learn better if they made note taking more interesting and entertaining then boring PowerPoints. Also group projects are always more desirable than projects in which you must work independently. Lectures, especially boring ones can be a problem in the classroom. Lectures in themselves aren't the problem usually it is the teacher giving them. Teachers need to find ways to appear entertaining, or interesting to their students if they wish to grasp their full attention." "If teachers were more interactive in lessons, then more kids would pay attention. I find my self playing games on the computer because I don't want to listen to a boring lecture. But if the teacher made the lesson plan fun and interactive, then most likely all of the kids would pay attention. People don't pay attention in class because of one reason: boredom. So if the teachers could find ways to make lesson plans interactive, the issue of boredom would go down." "Teachers would help me learn better if they interacted with the students more. A lot of teachers just like to do lectures and it ends up boring the class. If the teacher made the lesson more interactive, then the students would be able to grasp the concept of the lesson better. Lectures only make things boring and you don't grasp what's going on in that class. You just take notes and have to study them. But with an interactive lesson plan, you are able to grasp things right away and won't have to study as much because you really understood the lesson the day that you learned it." "Teachers would help me learn better if they taught with hands on projects. I learn through projects because you can see exactly what you're learning about. For example, in this class we've created the Roman armor. We had to read about the different parts and then figure out all of their details in order to make them. In biology, we build parts of the body, for example cells. It's interactive and keeps the brain active. I tend to find myself losing focus if just reading a text book." "Teachers would help me learn better if they taught in class instead of giving homework, used more videos to teach certain aspects of the lesson, had more group work, and used computers to help organize notes, help keep neat notes, help not lose notes." "I find it easier to learn from interacting with the class than sitting in a class room and studying a certain subject. If the class is just sitting and doing busy work, then it is more likely that some people, including me, will get distracted and go on different websites." "Computers are the future. They provide a portal to a whole other world, and infinite possibilities. A computer can be used to look up a famous person who you have never heard, or to look up statistics, or even just to use a calculator to crunch 289*3466, doubt you can do that in your head. With a computer everything including organizing becomes easier. Organizing especially is personally one of my biggest downfalls, before I came here and got my school laptop, I was one of the most unorganized people you would ever meet, now with a laptop, it is a lot easier to organize my notes." 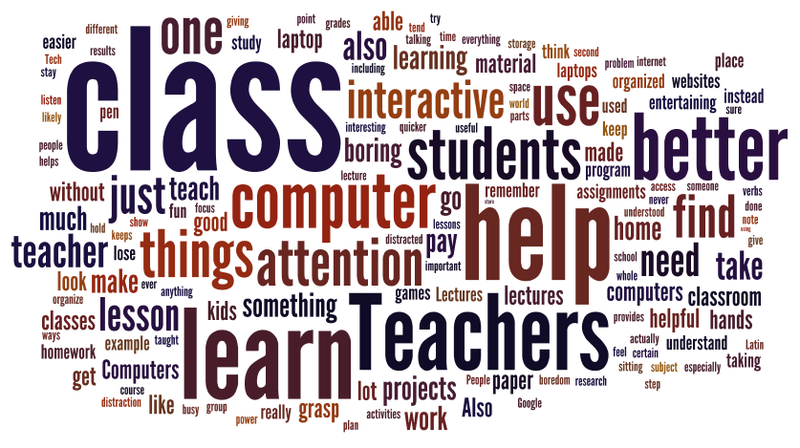 "Teachers would help me learn better if they would do something more interactive in class. They would also help if they would bring something entertaining to keep my attention. Teachers need to not talk at the students, but to the students. Teachers also shouldn't just force students to take notes as the entire class. Teachers need to actually teach the subject material, not just give random pointless assignments in class to keep students busy. Teacher shouldn't have things show up on the test that they didn't teach. Teachers shouldn't teach superfluous things that won't show up on tests, as they detract from learning the important material. Teachers would help student better if they would stop for a second to make sure each individual understands the material. Teachers should repeat important topics. Also, hands on is good, as hands on is fun and interactive. Teachers also need to be approachable for extra help." "I use tech a lot more in this class than in most of my other classes. I think that it is wayyyyyy more efficient in this class, it is very helpful." "I use the computer more in this class than any other class. but it's very helpful. I'm able to look things up instantly and helps me understand more." "I use my computer everyday in this class, probably twice as much in this class than in any other class. In some classes I hardly ever use it." "I find the computer to be more of a helpful resource in this class than in any other class." "Teachers would help me learn better if they were more hands on with their learning. It is very hard for me to learn when a teacher just rattles of information off a power point that I can access later. If I can access it at home and study at home then why do I need to pay attention in class? I don't, and so when teachers don't give me anything to work with besides a power point on my laptop and on a projector I will often get bored in class and not pay attention or fall asleep. Things like worksheets, activities, and class readings are what hold students attention. And without their attention you can't teach them a thing. For a teacher to hold my attention they need to present me with something I haven't seen before or at least in a way that holds my interest." "I try to use my computer every opportunity I get in all of my other classes. I find it incredibly useful and helpful for me to take quicker and more organized notes and also to research things that a teacher has said that I don't understand." "Compared to other classes, I use computers the most here. It seems like most other teachers don’t really trust teenagers with having laptops during class. I think they can overcome this barrier by talking to students as their friends instead of talking down to them." "Computers definitely help with this Latin class because there is a wider range of material to learn from and you can use programs that parse verbs which helps you to understand how those verbs will be translated. Also, it allows for students to collaborate without being distracted." "Latin revolves around the laptops. I think it's impossible to go through the course without one. We need it for Caesar's Gallic Wars and to take notes. You wouldn't be able to do the course without it. All of our assignments are done through a blog which is really convenient because you can get onto the internet anywhere. With paper, you may have to remember to have several things with you." "Teachers would help me learn better if they... removed computers from the classroom. Computers are too much of a distraction, and it is difficult to focus when there is a plethora of other activities that can be done on the computer, from games to messaging services to websites." I like to listen to my students. They know themselves pretty well. And they help me know them and they help me know how to teach them and they help me understand how to learn better together with them. Spent Memorial Day on boat in a quiet cove along the Wye River. And for at least a few hours I forgot that we've actually got two weeks of school left before summer begins. I'm looking forward to this summer. I look forward to every summer, but feel especially excited to start summer 2010. As usual, I'll be taking care of my three kids and we'll be hitting all the museums and free concerts Baltimore and DC have to offer. I'll also be working on finishing up a bit of writing I've been hacking away at and taking on some new language study -- this time Icelandic -- via the self-guided courses at University of Iceland online. Looking forward to visiting Denver for ISTE and seeing so many of the folks who I bat around ideas with via Twitter and elsewhere in the educational depths of the Internet. And I'm looking forward to working with the folks at Johns Hopkins on a new project where hopefully I'll be able to bring some ideas to the table that reflect the concerns and passions of so many of the folks who help make my daily professional development journey so rewarding. I think it'll be a great summer full of tons of unique opportunities for extending the old mind.